You are here: Home / Uncategorized / It’s Personal. Helping the Homeless Is Not Just a Job for this Cornerstones Care Manager. Growing up, Michael was active in sports and was especially talented at running track. Willy was also athletic, but it was his brilliance and outgoing personality that made him stand out. Michael recalls that at age 5, Willy could simply look at a broken-down car and tell you what was wrong with it – and he would be right. Willy even taught himself to play chess and actually defeated a seasoned Princeton chess club competitor. Willy was also a talented poet and deeply spiritual. Michael’s athletic talent resulted in a scholarship at St. Albans, a leading college preparatory and boarding school for boys. He was ultimately recruited by Ivy League schools, but chose to attend the University of Virginia to be near his girlfriend. School was difficult for Willy. He had trouble reading and would write his letters backward. There was no diagnosis at the time for what was “wrong” with Willy, but they know now that he was struggling with dyslexia. Willy eventually stopped attending school, but received his GED and then served for three years in the Army. Following his service, he worked odd jobs and found success as a furniture upholsterer. It was while Willy was staying with Michael at UVA that Michael discovered Willy was selling and smoking marijuana. Michael lost someone close to him because of a drug overdose, and he was scared about the path Willy was following. Michael concentrated on his studies, graduating with a degree in psychology. He and his girlfriend married and began to build their lives together. Michael would see Willy on occasion during family holidays, but as the years went on, it became harder and harder to stay in touch. It was when Michael and his wife moved home after college that they learned his brother was panhandling on the city streets. Heroin was prevalent at the time, and Willy had become an addict. Their extended family would provide reports when they would spot Willy, and Michael would drive the streets and search homeless shelters to try to find him. Sometimes Michael would find him, but Willy would run away. 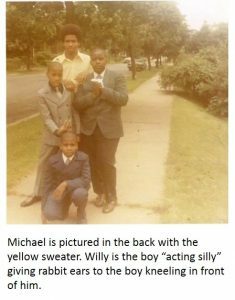 Michael knew it was because Willy didn’t want him to see him that way. “It’s hard to express the pain you feel not knowing where your brother is. Is he safe? Is he hungry? On cold days, you worry if he’s cold. On hot days, you worry if he has shelter. It was like he was a ghost that you couldn’t get your hands on. My biggest fear was that Willy would die on the streets and we’d never know it,” said Michael. To keep Willy from running when he would find him, Michael tried a new approach — he would drive by and yell out updates about their family. Sometimes Michael would shout out a joke, but withhold the punchline. He told Willy that if he wanted to hear the punchline, he couldn’t run away the next time they saw each other. It worked. So, Michael continued to drive the streets, find his brother and tell him a joke, sharing the punchline during his next drive-by. It was a limited connection, but at least Michael could see his brother and know that he was alive. Willy fought his addiction every day. He would have “clean” periods that would last two to three years. He would re-engage with his family, begin his furniture work, establish his home. But, the stretches between being clean became longer and longer, and his periods of actually being clean became shorter and shorter. Drug addiction and life on the streets eventually took its toll. Willy passed away when he was just 45 years old. Michael began what developed into a 20-year career working with at-risk families and children living in group homes or public housing. Over time he transitioned to a better-paying career as a government contractor. While at work one day, he received a call about a job opportunity from the director of the Embry Rucker Community Shelter (ERCS) with whom Michael had worked in the past. Individuals or families entering the Embry Rucker Community Shelter are immediately assigned a Cornerstones care manager who helps them develop a customized action plan focused on getting them into housing as soon as possible. They are provided with the supports they need to remain stable. An array of direct and indirect services and resources are offered, from housing location services, job readiness training, financial assistance, and subsidized childcare to assistance with accessing benefits, legal services and mental health support. Michael has been a care manager at Cornerstones for six years now. “I feel like ERCS is where I am supposed to be. I get as much from the clients as they get from me. And, the staff and volunteers here have become my extended family,” said Michael. Click here to read about “Jeff”, who struggled to find solutions to his need for steady work and budget management, and how Michael helped him on a path to stability.